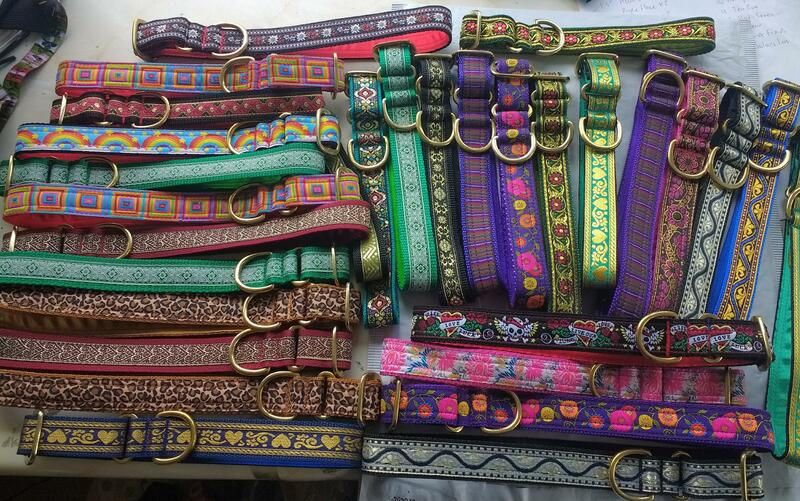 Luxury Swiss velvet dog collars in all colours, brass fittings and satin linings. Available in two widths and three styles here are the Kitsch washable velvet collars. 25mm wide for all breeds but the toy/puppy sized dog who would need the 20mm width. Please email me after ordering if you wish to have the 20mm width. If you have ordered a wide jacquard hound collar and want the velvet to match but are unsure of the best colour, click "perfect match" and I will match it for you! Single loop for smaller dogs that don't want the side release clip or for Sighthounds as a tag/house collar. Martingale for smaller Sighthounds (Sighthound puppies, Italian Greyhounds or smaller Whippets) or other breeds as a half check safety collar for walking. Side release or "clip apart" collars for all breeds. In this 25mm width, the smallest size for a clip apart would be 13" neck upwards. For smaller sizes go for a 20mm side release as the clip is less bulky. The trim is quality Swiss velvet by Berisfords. All collars have satin linings. All are washable at 40 in a machine. The fittings are solid brass. Super strong and tough for outdoor walkies. Go on, chuck that uncomfortable leather collar away!